It’s that time of year again dollface, where ghouls and goblins come out to play! I’ve told you all about my love of Halloween last year and spoke about my obsession with horror movies and all things scary. 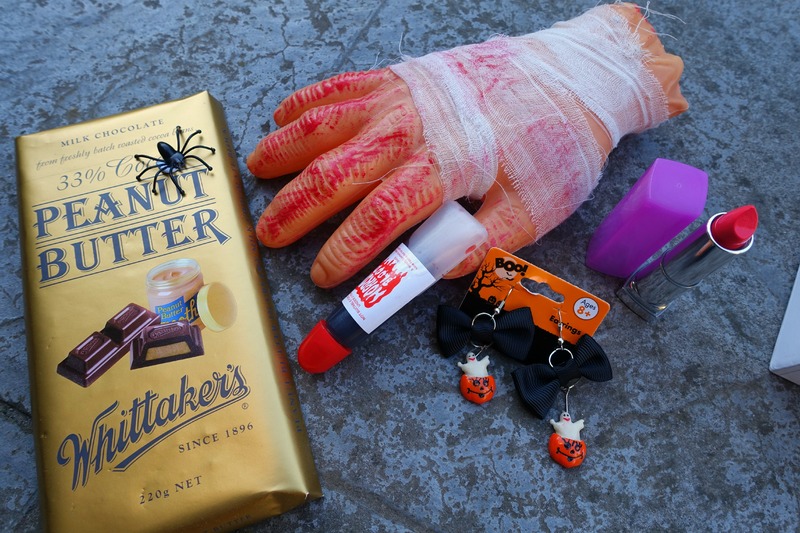 So it’s no wonder I threw my hand up when the lovely lasses Nikita and Jasmine at Bloggers United put a call out for participants in a Halloween-themed box swap. I was paired with Tegan from Permanent Procrastination; a fabulous lifestyle blog with beautiful pics that oozes Tegan’s fabulous personality. First things first, we both agreed on an amount to spend and then decided on what to fill the boxes with. Being Halloween we couldn’t go past some spooky, ghoulish looking decorations and of course some candy! And make-up, because MAKE-UP, do we really need to explain?! I gave Tegan a few hints as to what I like (lipstick, peanut butter – you know, standard Rosie stuff) and she really outdid herself. Just look at the box and how it arrived! 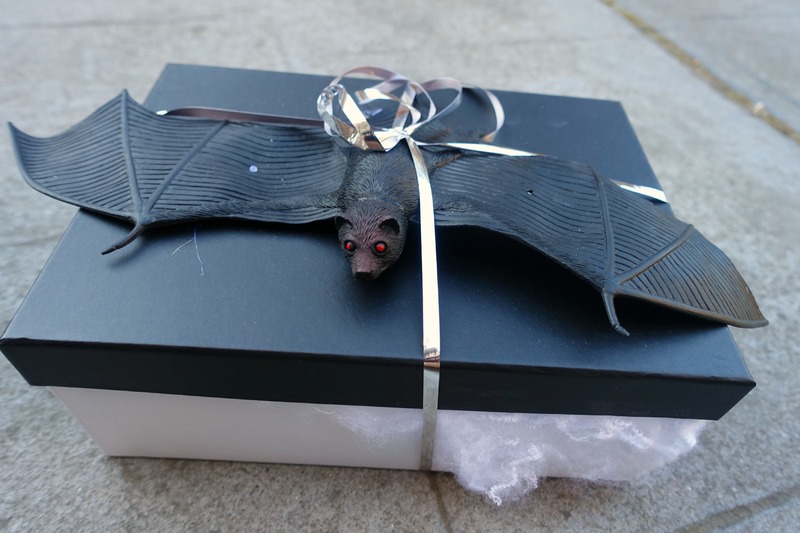 I mean that bat and those spider webs alone got me super excited. I felt so bad that I didn’t decorate my box so creatively. 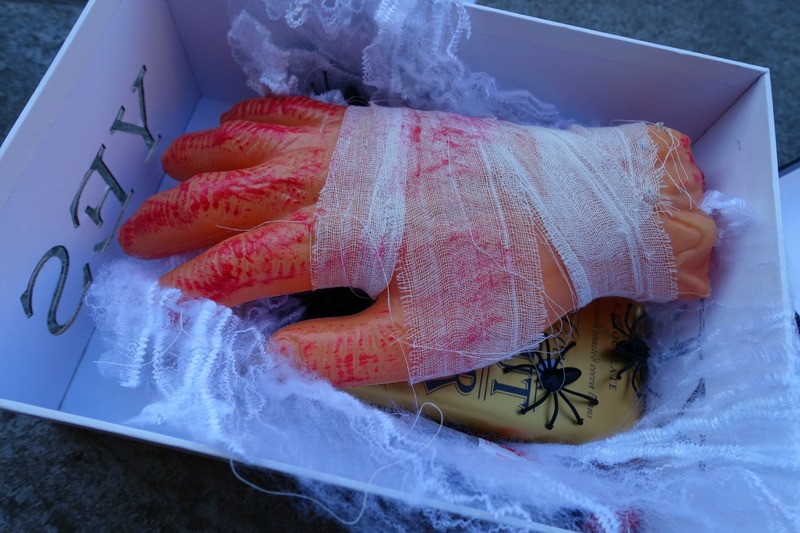 Once I opened up the box a filthy severed hand greeted me and I let out the biggest giggle….GROSS!! I love it! Underneath the hand there was some cute pumpkin/ghost earrings which will be perfect for my office Halloween dress up this Friday. Also a tube of fake blood which can come in very handy now and then, don’t ask! AND OMG PEANUT BUTTER CHOCOLATE….Can’t wait to tear into this sucker. 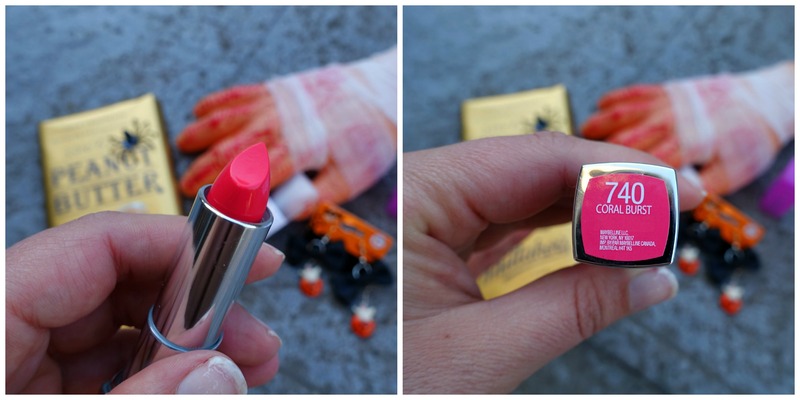 And last but not least, the most gorgeous Maybelline lipstick in Coral Burst which I immediately tore open and wore to work. Thanks so much Tegan!! I love it all. Make sure to check out her blog and her beautiful Instagram page. Are you a fan of Halloween? What are you doing to celebrate this year? No one else I know is overly into it though. I’ll put up a post later today with the little Halloween Book Critters I made and have displayed at work which were great times. Even Hubby who is half American and his Pa who is full blooded aren’t really into Halloween or even Thanksgiving. They are VERY Australian hahaha. That sounds like it was a lot of fun! I’m yet to experience Halloween in the US – I think it’d be amazing!!! Wow, Tegan did so well!! I’d probably scream if I open the box and saw the spiders then realised they’re fake hahaha.